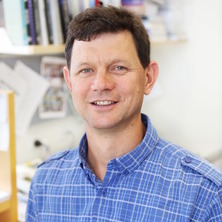 Matt Sweet is an NHMRC Senior Research Fellow and Group Leader at the Institute for Molecular Bioscience (IMB) at The University of Queensland, Brisbane, Australia. He was the founding Director of the IMB Centre for Inflammation and Disease Research (2014-2018), and also served as Deputy Head of the IMB Division of Cell Biology and Molecular Medicine during this period. Matt studies innate immunity, the body’s danger sensing system that responds to infection, injury and dysregulated homeostasis, and the role of this system in health and disease. Matt’s research team is focused on characterizing the roles of specific innate immune pattern recognition receptors and their downstream signalling pathways/gene products in inflammatory disease processes, as well as in host responses to bacterial pathogens. He has authored ~140 journal articles and book chapters, including in Science, PNAS USA (3), Science Immunology, Nature Genetics, Nature Communications (2) and Journal of Experimental Medicine (2), and his career publications have accrued >10,700 citations. I was awarded a PhD (The University of Queensland) in 1996 for my research under the supervision of Prof David Hume into gene regulation in macrophages, immune cells with important roles in health and disease. I subsequently undertook a short postdoctoral position in the same laboratory, focusing on the activation of macrophages by pathogen products. I then embarked on a CJ Martin post-doctoral training fellowship with Prof Eddy Liew, FRS at the University of Glasgow in Scotland. Returning to The University of Queensland, I had a prominent role within the Cooperative Research Centre for Chronic Inflammatory Diseases (including as UQ node head from 2007-2008) and was appointed as a Group Leader at the IMB in 2007. I was subsequently awarded an ARC Future Fellowship, and I have been an NHMRC Senior Research Fellow since 2011. CpG-containing DNA as an activator of innate immunity, and characterization of the receptor (TLR9) detecting this microbial component. The IL-1 receptor family member ST2 as a critical regulator of innate immunity and inflammation. Inflammatory and antimicrobial functions of histone deacetylase enzymes (HDACs) in macrophages. Effects of the growth factor CSF-1 on inflammatory responses in macrophages. Mechanisms responsible for divergence in TLR responses between human and mouse macrophages, as well as the functional consequences of such divergence. TLR-inducible zinc toxicity as an antimicrobial weapon of macrophages. Host evasion strategies used by the bacterial pathogens Salmonella enterica serovar Typhimurium and uropathogenic E. coli. SCIMP as a novel TLR adaptor that mediates TLR tyrosine phosphorylation and selective cytokine outputs. Genes and pathways associated with the severity of chronic liver disease. I have supervised or co-supervised 22 completed PhD students and 20 completed honours students, as well as 9 post-doctoral researchers. Many of my former staff and students continue to have active research careers around the world (USA, UK, Europe, Australia), including as independent laboratory heads. I currently supervise 5 PhD students in my laboratory, co-supervise 1 PhD student in another laboratory, and oversee the research activities of 3 post-doctoral researchers in my group. Current and former staff/students have received numerous fellowships and awards during their research careers (e.g. ARC DECRA, NHMRC CJ Martin fellowship, UQ post-doctoral fellowship, Smart State scholarship). I have also examined 18 PhD theses in the fields of innate immunity, inflammation and host defence. I am an editorial board member of the Journal of Leukocyte Biology, Immunology and Cell Biology, Seminars in Cell & Developmental Biology, and Frontiers in Immunology. I have served on NHMRC project grant review panels in 2007, 2008, 2009, 2012 (as panel chair) and 2014, as well as a member of the NHMRC RGMS user reference group committee from 2010-2012. I acted as national representative for the Australasian Society of Immunology (ASI) Infection and Immunity special interest group from 2012-2017. At UQ, I served as chair of an animal ethics committee from 2013-2014, and co-organized the UQ Host-Pathogen interaction network from 2007-2010 (prior to the establishment of the Australian Infectious Diseases Research Centre). I have made extensive contributions to conference organization in my discipline. I co-organized the national TLROZ2009 and TLROZ2012 conferences, I organized the first ever Australasian Society for Immunology (ASI) Infection and Immunity workshop (2009), was chair of the ASI Program Committee and co-organizer of the Infection and Immunity workshop for ASI2017, and I co-organized the annual IMB Inflammation Symposium (2014-2018). In addition, I have been a member of the organizing committee for ASI2009, the 2014 International Cytokine and Interferon Society conference, the Lorne Infection and Immunity conference (2014 to the present), and the Brisbane Immunology Group annual meeting (2008 to the present). I am currently acting as co-chair for the 2019 World Conference of Inflammation (to be held in Sydney in September 2019). Cells of the innate immune system such as macrophages play essential roles in detecting and responding to danger, which can be sensed as a result of infection, injury and/or dysregulated homeostasis. These cells use several families of pattern recognition receptors (PRRs), such as the toll-like receptors (TLRs) and nod-like receptors (NLRs), to recognize specific danger signals. Inappropriate or prolonged PRR activation drives dysregulated inflammation, which is central to the pathology of many acute and chronic diseases. Current research is focused on developing approaches to target PRR signaling pathways and other innate immune pathways for potential applications in inflammatory diseases such as chronic liver disease, sepsis and inflammatory bowel diseases. Areas of specific interest including characterizing mechanisms by which novel TLR complex components provide specificity to inflammatory cytokine production, control of inflammatory outputs by TLR/G protein-coupled receptor cross-talk and the roles of individual HDAC enzymes in macrophage inflammatory pathways. Innate immunity plays a pivotal role in protecting against invading microorganisms, but successful pathogens are able to overcome this system to cause disease. Indeed, many important pathogens actively target macrophages, residing in these cells or destroying them to avoid immune defence. We study TLR-inducible macrophage antimicrobial responses, and how the Gram-negative bacterial pathogens Salmonella enterica serovar Typhimurium (S. Typhimurium) and uropathogenic E. coli (UPEC) are able to overcome such responses. Our focus is on developing novel anti-infective approaches, through the manipulation of innate immune antimicrobial pathways. Areas of specific interest include understanding how trafficking of zinc and other metal ions contribute to TLR-inducible macrophage antimicrobial responses against S. Typhimurium and UPEC, defining mechanisms by which specific HDAC enzymes control macrophage host defence pathways, and the contributions of UPEC-triggered macrophage cell death to immune defence versus host subversion. Whilst conservation of a gene or pathway across species is an obvious indicator of its importance, the fact that a gene or a pathway is not conserved does not mean that it isn’t important for one particular species. In fact, in the context of co-evolution of host and pathogen, species-specific responses are likely to be critical for host defence. We have characterized differences in TLR responses between human and mouse, and the mechanisms responsible. Our current focus is on characterizing the roles of individual TLR target genes that are differentially regulated between human and mouse in host defence against bacterial pathogens and in inflammatory responses. Every organism and every cell employs some form of innate defence for protection against agents with the ability to cause harm. In complex multicellular organisms, these innate defence systems also have the capacity to cause damage to the organism itself. As such, innate immunity lies at the heart of almost all disease processes. Our fundamental research in this field has the potential to lead to new anti-infective and/or anti-inflammatory agents that may have applications in the health, livestock and/or veterinary sectors. · Approximately 140 career publications, which have collectively accrued over 10,700 citations (average cites/article: >75; most cited article: ~850 citations; >200 citations of my research in Cell, Science, Natureand Nature specialty journals (e.g. Nature Immunologyetc)). My publications include 33 invited review articles, editorials and book chapters, and of these, 4 reviews have received more than 200 citations, another 5 have received more than 100 citations, and 1 received the Dolph Adams award from the Journal of Leukocyte Biology. I have also been invited to guest edit review series for Seminars in Cell and Developmental Biology, Immunology and Cell Biology and Journal of Leukocyte Biology. · Contribution to the development and/or validation of several novel small molecule inhibitors of inflammation-relevant proteins, and numerous interactions with the Pharmaceutical/Biotechnology industry. · Identification of a gene signature associated with severity of chronic liver disease, with these findings currently being pursued for discovery of biomarkers and therapeutic targets. · ~100 invitations to speak nationally and internationally at conferences, institute/departmental seminars, and other forums. I have also chaired >30 sessions at national and international conferences. Journal Article: Strain- and host species-specific inflammasome activation, IL-1β release, and cell death in macrophages infected with uropathogenic Escherichia coli. We have found that specific HDAC enzymes constrain human macrophage antimicrobial responses, particularly the production of mitochondrial reactive oxygen species. Hence, targeting of such enzymes can boost macrophage-mediated clearance of intracellular bacterial pathogens. This project will explore the specific molecular mechanisms by which HDACs constrain macrophage antimicrobial pathways, and will investigate novel anti-infective approaches that target HDAC enzymes. Several projects are available to investigate different aspects of TLR-inducible inflammatory pathways in macrophages, including the role of a novel TLR adaptor in providing specificity to inflammatory cytokine output from macrophages, links between HDACs and metabolic pathways in macrophage-mediated inflammation, the functions of specific GPCRs in regulating TLR-inducible inflammatory pathways in macrophages, and the role of a human-specific TLR-inducible ubiquitin ligase in regulating macrophage inflammatory responses. The role of monocytes and macrophages in innate immunity: macrophage anti-microbial pathways. Sweet, Matthew J. and Bokil, Nilesh J. (2010). The role of monocytes and macrophages in innate immunity: macrophage anti-microbial pathways.. In Clay B. Marsh, Susheela Tridandapani and Melissa G. Piper (Ed. ), Regulation of innate immune function (pp. 1-31) Kerala, India: Transworld Research Network. Sweet, MJ and Hume, DA (2003) CSF-1 as a regulator of macrophage activation and immune responses. Archivum Immunologiae Et Therapiae Experimentalis, 51 3: 169-177. Wei, X.Q., Leung, B.P., Niedbala, W., Piedrafita, D., Feng, G.J., Sweet, M., Dobbie, L., Smith, A.J. and Liew F.Y. (1999) Altered immune responses and susceptibility to Leishmania major and Staphylococcus aureus infection in IL-18-deficient mice. Journal of Immunology, 163 5: 2821-2828. Sweet, M. J. and Hume, D. A. (1995) RAW264 macrophages stably transfected with an HIV-1-LTR reporter gene provide a sensitive bioassay for analysis of signalling pathways in macrophages stimulated with lipopolysaccharide, TNF-α or taxol. Journal of Inflammation, 45 2: 126-135. Murphy, Kathleen M., Sweet, Matthew J., Ross, Ian L. and Hume, David A. (1993) Effects of the tat and nef gene products of human immunodeficiency virus type 1 (HIV-1) on transcription controlled by the HIV-1 long terminal repeat and on cell growth in macrophages. Journal of Virology, 67 12: 6956-6964. Irvine, Katharine M., Burns, Christopher J., Wilks, Andrew F., Bu, Xiangyong, Harte, Michael F., Su, Stephen, Hume, David A. and Sweet, Matthew J. (2005). A potent CSF-1 Receptor tyrosine kinase inhibitor targets survival and effector functions in marine macrophage populations. In: Inflammation Research. , , (S148-S148). .
Lattin, Jane E., Blomberg, Lovisa M., Daly, Norelle L., Craik, David J., Robinson, Jodie A., Kellie, Stuart, Hume, David A. and Sweet, Matthew J. (2005). Beta-arrestin expression and function in macrophages. In: Inflammation 2005: Book of Abstracts. 7th World Congress on Inflammation: Inflammation 2005: Inflammation, the Key to much pathology, Melbourne, Australia, (S157-S158). 20 - 24 August 2005. The development of tyrosine kinase inhibitors for the treatment of inflammation and malignant disease. Mechanisms of action of the anti-inflammatory molecule ST2/T1 on macrophages.